In the new movie "Love Actually," Liam Neeson plays a man mourning the loss of his wife while dealing with a distant stepson, who is a little boy played by Thomas Sangster. He eventually finds out the distance isn't caused by sadness, but by a much different emotion: love. Known for his dramatic work, Neeson tells The Early Show co-anchor Harry Smith he wanted to do the romantic comedy after he read the script. The story is written by Richard Curtis who is known for his work in "The Black Adder," "Four Weddings And A Funeral," "Bridget Jones's Diary," "Notting Hill," the "Mr. Bean" series and more. "Love Actually" is his directorial debut. Neeson says, "I've always admired his writing. This film was his directorial debut and I knew he knew what to do, and it is a genre I have not tapped into before." And Neeson points out, Curtis just believes in love. "He's incredibly cynical and as smart as a button, very wry intelligence, but yet, when it comes down to it, he and this lady, he genuinely sees love all around and feels we're not reminded of it enough." The ensemble cast includes Hugh Grant, Colin Firth, Laura Linney, Emma Thompson, Rowan Atkinson and many more. But the person Neeson got to know well was Thomas Sangster. "He upped the ante quite a bit, actually, because he's one of those rare actors who when he speaks the lines, he believes he thought them up himself," Neeson says about the young Thomas. "And he takes no prisoners. You have to be truthful back to him. He looks right into your soul." Last year, Neeson was seen on Broadway performing "The Crucible." What lured him to the stage? "Well, I'm going to try it once every two years," Neeson says, "My early years were in Ireland where all theater based, so I miss it." William John Neeson was born in Ballymena, Northern Ireland, on June 7, 1952. In 1961, Neeson, at the age 9, joined a boxing team run by a priest. In 1967, he had his nose broken during a childhood boxing match (date approximate). As a teenager, Neeson drove a forklift for a brewery; he planned to become a teacher, then an architect before answering an ad placed by the Lyric Players' Theatre in Belfast. Neeson made his professional stage debut in "The Risen People" at Lyric Player's Theatre, Belfast, in 1976. In 1979, Neeson made his educational film debut as Jesus Christ in a film based on John Bunyan's "The Pilgrim's Progress" for evangelical Bible students in Ireland (date approximate). In 1980, Neeson played Lenny in the Abbey Theatre production of "Of Mice and Men"; spotted by director John Boorman who later cast the actor in "Excalibur." In 1981, Neeson made his feature film debut as Sir Gawain in Boorman's "Excalibur." In 1984, Neeson made his United States television debut in the CBS miniseries "Ellis Island"; co-starred as Blackie O'Neill in the syndicated miniseries "A Woman of Substance." In 1986, the actor was a guest star on the "Miami Vice" third season opener, playing an IRA operative; reprised role of Blackie O'Neill in the syndicated miniseries sequel "Hold That Dream." In 1987, Neeson moved to Los Angeles; featured as a deaf-mute man falsely accused of murder and defended by Cher in "Suspect." In 1988, Neeson had featured roles in "The Good Mother" and "The Dead Pool." In 1990, Neeson made his feature starring debut as the titular tortured antihero of "Darkman." In 1992, the actor made his Broadway debut in "Anna Christie"; featured in the World War II romance "Shining Through" and Woody Allen's "Husbands and Wives." In 1993, Neeson had a title role in "Ethan Frome"; the actor had his breakthrough screen role as Oskar Schindler in "Schindler's List"; received a Best Actor Oscar nomination. 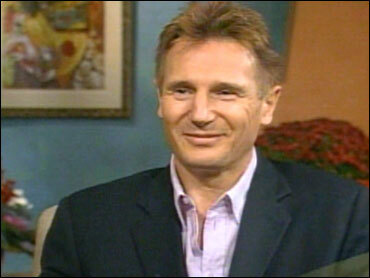 In 1994, Neeson co-starred with Natasha Richardson and Jodie Foster in "Nell." In 1995, the actor played title role in the Scotland-set historical adventure "Rob Roy." In 1996, Neeson had a featured role as a father whose teenaged son in charged with murder in "Before and After", co-starring with Meryl Streep and Edward Furlong; starred as the title revolutionary in Neil Jordan's controversial film "Michael Collins," co-starring Julia Roberts and Aidan Quinn. In 1998, Neeson returned to Broadway playing Oscar Wilde in David Hare's drama "The Judas Kiss"; Starred as Jean Valjean in Bille August's adaptation of Victor Hugo's classic tale of injustice "Les Miserables." In 1999, Neeson played Jedi Master Qui-Gon Jinn in "Star Wars: Episode I --The Phantom Menace"; the actor portrayed a professor who conducts psychological experiments in Jan De Bont's remake of "The Haunting." In 2002, Neeson appeared with Harrison Ford in the submarine thriller "K19: The Widowmaker"; he also received an Order of the British Empire Award from Queen Elizabeth for his stage and screen career; Appeared in the highly anticipated Martin Scorsese film "Gangs of New York."